Here is a piece of advice for Prime Minister Ehud Olmert: Take a few hours off over the weekend, before the game determining who comes in third in the World Cup, and read Ami Gluska's book, "Eshkol, ten pkuda!" (literally, "Eshkol, give an order"; the book is due to be published this month as "The Israeli Military and the Origins of the 1967 War: Government, Armed Forces and Defense Policy 1963-1967," by Routledge). The book describes the background to the Six-Day War and there is no better account of the deterioration and weakness of the leadership that led Israel into a war it did not want. Then as now, a "civilian" leadership contended with an activist army, which amassed forces and sought to exploit the opportunity to deliver a crushing blow to the Egyptian troops that were concentrated in Sinai. The prime minister, Levi Eshkol, tried to prevent the confrontation and to attract international support, but failed to stop the escalation. Every new provocation by then Egyptian president Gamal Abdel Nasser further undermined Eshkol's ability to hold his own against the army. The end of the story, as everyone knows, is that Eshkol lost the defense portfolio to Moshe Dayan and Israel went to war, savaged Egypt, Jordan and Syria, and seized the "territories" from them. Since then the debate over whether this was good or bad for the Jews has not stopped. This week Olmert and Defense Minister Amir Peretz found themselves in Eshkol's shoes. Like him, they are trying to stop an escalation that no one wants - a large-scale military operation in the style of Operation Defensive Shield in the West Bank in 2002, which will bring the Israel Defense Forces back into the heart of Gaza's towns and the refugee camps, in order to deliver a death blow to the military wing of Hamas and to undermine the movement's civilian government. All those in the know say the two men oppose an operation of this kind, which will also entail an extensive call-up of reserve units. But the events are pointing in the opposite direction. Olmert has one important advantage over Eshkol: He does not face a united front put up by the defense establishment. He is exploiting for his benefit the rivalry between the head of the Shin Bet security service, Yuval Diskin, and the chief of staff, Dan Halutz. The two had a falling out during the disengagement operation last year. The background was the army's insistence on giving the Shin Bet a marginal role in the operation. Attempts at mediation and compromise failed and Ariel Sharon, prime minister at the time, did not make enough of an effort to douse the flames before they erupted into a personal clash, which has since expanded to encompass also a quarrel between Diskin and the director of Military Intelligence, Major General Amos Yadlin. These disputes are allowing Olmert to pursue a divide-and-rule policy between the senior figures in the defense establishment. In the security cabinet meeting on Wednesday it was plain, and not for the first time, that he is leaning on Diskin, who proposed moving at a slower pace than that recommended by the chief of staff. The defense minister is also "listening very attentively" to the opinions and recommendations of the Shin Bet chief. The prime minister this week made two important decisions. The first was to remain steadfast in his opposition to conducting negotiations with the kidnappers of Corporal Gilad Shalit and to freeing prisoners in return for his release. On Monday Olmert rejected the kidnappers' ultimatum. He was right in his assessment that they would "blink first" and not damage the bargaining chip they hold. The Palestinian response was to fire a Qassam rocket into Ashkelon on Tuesday, 13 hours after the ultimatum expired. Benjamin Netanyahu's warning of years ago against "Katyushas falling on Ashkelon" was abruptly realized. The rocket, which landed in a schoolyard, led the political echelon to drop its inhibitions, which the previous week prompted it to veto an IDF initiative for a ground operation in the northern part of the Gaza Strip. Shortly after the Ashkelon incident, Olmert delivered a militant speech against Hamas at the Independence Day party thrown by the United States ambassador, Richard Jones, in which he threatened "unparalleled and far-reaching consequences." The following day the prime minister and defense minister authorized the entry of extensive ground forces into the northern sector, the site of three Israeli settlements - Elei Sinai, Nisanit and Dugit - until the pullout last summer. Preventing the launching of Qassam rockets has become the major thrust of Operation Summer Rains, with the return of Corporal Shalit relegated to second place. The Qassams have dislodged the soldier. The management of the campaign in the south this week dominated the prime minister's agenda. The "business as usual" pose disappeared. The convergence plan in the West Bank, about which Olmert spoke ardently just last week, was also no longer men tioned in his speeches. 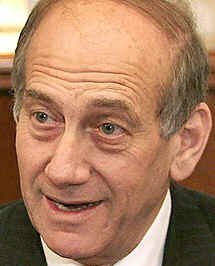 Olmert is holding the button that controls the height of the flames and slowly turning it rightward. The result is gradual escalation, which depends on the initiative of the Palestinian side. Military history - in Vietnam, for example - shows that this kind of "trickling" of military might ensures the control of the political echelon, but not a victory on the field of battle. People who attended meetings and consultations with the prime minister this week lauded his behavior: "He is cool-headed, knows what he is up against, expresses himself well and is not afraid of anyone." Cool-headedness and self-control are important, but are not the goal. The end result is what counts, and from that point of view there is nothing to boast about where Operation Summer Rains is concerned, because it has not yet accomplished anything. It has not brought Shalit home and it has not stopped the Qassams. On Tuesday morning, between the expiration of the kidnappers' ultimatum and the landing of the Qassam rocket in Ashkelon, the prime minister made his first visit to the front. In honor of the event he wore a light-blue shirt with an open collar, leaving his jacket and tie in the car. The first rule of image advisors is always that leaders must never be photographed with soldiers wearing a suit and tie. George Bush follows this rule in Iraq, and Israeli leaders since David Ben-Gurion have always followed it. During the next event, not long afterward, Olmert was back in his familiar garb: dark brown suit, white shirt, orange tie. The prime minister's tour of the frontline began in Sderot, which he had avoided since the elections. He explained that a well-publicized visit to the Qassam-battered town would encourage the Palestinians to welcome him with a volley of rockets, and so he snuck in secretly. The mayor, Eli Moyal, and the heads of the local regional councils thought they had been invited to meet with the director general of the Prime Minister's Office, but that was just a cover story. Olmert and Peretz were waiting for them in the town's community center, next to the swimming pool. Moyal, Olmert's outspoken rival, greeted him with sycophantic remarks about his concern for employment in Sderot when Olmert was minister of industry and trade and minister of finance. And then came the sting, when Moyal asked: Would you have shown such concern for Sderot even without the kidnapping of the soldier? The defense minister, who lives close to the Sderot community center, replied that the operation had been planned in advance. Olmert took a moralizing stance: In Jerusalem there was a time when we had two suicide bombings a week, he reminded Moyal, and the role of elected officials is to spread calm, not to speak in the name of the irate public. Moyal has come down hard on Olmert in the past few weeks, attacking him on every radio talk show for not visiting Sderot. Olmert's aides noted ahead of the visit that Moyal would continue to jab at the prime minister even after he came to Sderot - and they were right, of course. The headlines that emerged from Sderot mocked Olmert's diversionary ruse. From Sderot Olmert proceeded to the headquarters of the Gaza Division, where a test of leadership awaited him. He sat at the head of a long U-shaped table and listened to presentations about the operational activity. In front of him was a laptop, so he could better grasp the material. At the end of the meeting he was asked to explain to the commanders why he was not issuing the order for them to charge the enemy. Olmert replied with the well-known comment, made by Moshe Dayan in the Sinai War of 1956, when Dayan was chief of staff: "I would rather restrain galloping horses than whip lazy mules." I have exceptional praise for the activity you have done, Olmert said - keep initiating and we will decide. Members of Olmert's retinue noted the different approaches among the officers. The brigade commanders sounded hungry for action, as did the chief of staff. The GOC Southern Command, Yoav Galant, seemed to be in the middle, with a more balanced approach. Maybe that is because of the many years he spent as Sharon's military secretary, which exposed him directly to the considerations of the political echelon vis-a-vis the confrontation with the Palestinians. The prime minister and the defense minister this week presented a uniform stance. This is not a passionate summer fling, but a convergence of interests. They have no desire for a deterioration that will bring the right-wing parties into a "national emergency government against terrorism" and bury the realignment plan for good. The consideration that is guiding Olmert in his management of the war, as he explained to the security cabinet, is to preserve international legitimization for Israel's moves. And to do that, it is important to avoid, as far as possible, killing Palestinian civilians who are not engaged in terrorism and to take the humanitarian side into consideration. His position has solid backing in the security cabinet, which is displaying a "civil" approach. The activist extreme is occupied by Public Security Minister Avi Dichter, who is urging "a total cessation of the firing of Qassams." The members of the security cabinet discerned the differences of approach between Dichter and Yuval Diskin, his former deputy and now his successor as Shin Bet chief. In the meantime, Israel is enjoying freedom of maneuver. The Palestinian Qassams are of far less interest to the international community than the missiles launched his week by North Korea. The urgent United Nations reports about a humanitarian crisis in the Gaza Strip are not getting headlines. The U.S. position, as it is understood in Jerusalem, shows an interesting distinction: The administration wants Israel to avoid harming the population in Gaza, so as not to arouse European and Arab criticism, but will be happy with an Israeli blow that will topple Hamas. Hamas' victory in the Palestinian Authority elections wrecked Bush's doctrine of Arab democracy and was taken as a personal affront to the president. Operation Summer Rains is creating an opportunity to eliminate that problem; just as in 1967, the final decision to go to war was made in the wake of an American message. The head of the Mossad espionage agency at the time, Meir Amit, made a last-minute visit to Washington and reported on his return to Jerusalem, that "the Americans would welcome an operation, if we succeeded in smashing Nasser." His report removed Levi Eshkol's final hesitation.